Pirelli tyre advertising from the 1950s. Homepage. This page: Two leaflets from 1953 promote Pirelli Blue Riband & Aerflex crossply tyres. Just as now, in the 1950s there were plenty of tyre brands to choose from, once the decision whether to fit new or remould crossply tyres had been taken of course. 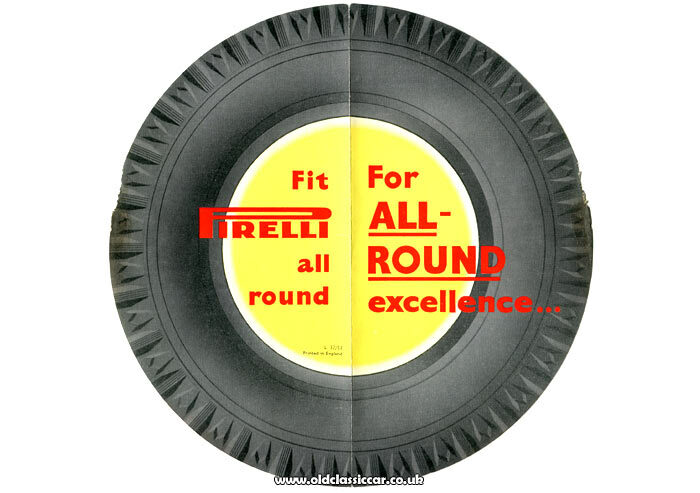 A number of advertising items relating to these manufacturers can be found across the site, this page though features two leaflets published by Pirelli in 1953. Both are quite eye-catching in their design. The first is circular, once un-folded, and incorporates an illustration of a tyre with the slogan "Fit Pirelli all round For ALL-ROUND excellence...". "Fit Pirelli - and what have you got? A tyre of outstanding merit with nearly 50 years technical experience behind it. A tyre of in-built quality and advanced design. A tyre that will give you the utmost in hard wear, dependability and carefree security. No other tyre will serve you so well or save you so much." The firm continues to be known, not just for road vehicle tyres, but also for those used in motorsport, including - at this time - Formula One. While Pirelli can trace its roots back to 1872, it was in 1901 that the first car tyre was produced, this, after several years experience of constructing cycle tyres. Although originally located in Milan, it wasn't long before overseas plants were established, that in Britain being constructed in 1914. The reverse side of the second leaflet (below) makes reference to them being "BRITISH MADE AT BURTON-ON-TRENT - Famous The World Over". 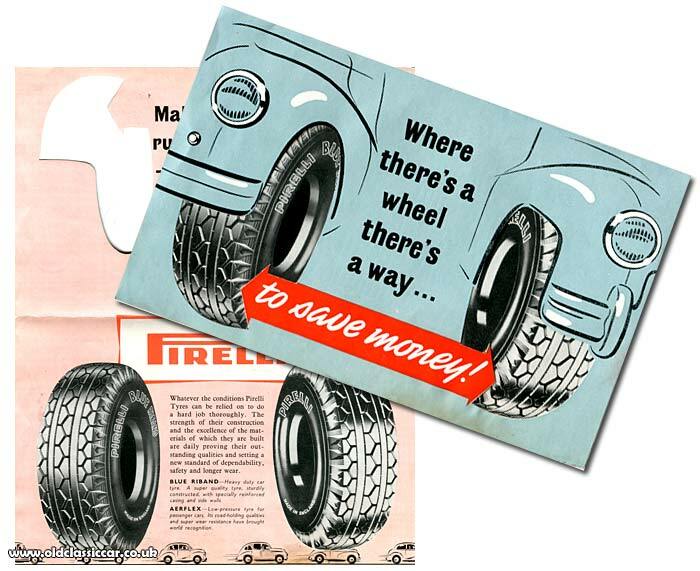 Leaflet number two, also from 1953, runs with the slogan "Where there's a wheel there's a way ... to save money!" and portrays two cars, one fitted with the Blue Riband type while the other has Aerflex. The tyre illustrations are in fact printed inside the leaflet, and visible from the front also thanks to cut-outs let into the cover. Illustrations of both types again feature, as do several natty drawings of cars driving along on their products. The two cars in the centre look suspiciously like an Austin A40 Dorset, in hot pursuit of a post-war Hillman Minx. Return to the Motoring Collectables section. Here you'll find similar promotional material from rivals such as Dunlop, Avon, and India.